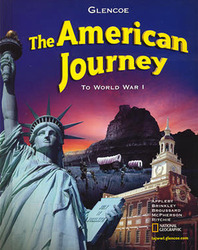 The American Journey is a student-friendly presentation of American history, from pre-exploration to World War I. Its unparalleled author team, including National Geographic, ensures accuracy in every detail of the narrative, maps, and charts. The program emphasizes skill development from reading maps to analyzing primary and secondary sources to exploring the connections between history and geography, economics, government, citizenship, and current events. Promote social studies literacy, encourage the understanding of informational text, and help students become successful readers with research-based active reading strategies. A dress state standards in American history. This program integrates content and skills in each lesson, and prepares students for classroom and standardized examinations. Invite students to participate in high-interest projects with hands-on History Lab activities that encourage them to see history through the eyes of the participants.